2017 has been a meaningful year for Californians for Justice. In the wake of a federal government that endorses hate, racism, and growing inequality, it has reaffirmed our commitment and fired us up even more to organize, resist, and lead the way with progressive policy solutions and action to transform public education – for the sake of education and social justice. San Jose: Won a 3-year commitment to adopt Relationship Centered Schools in East San Jose, including 3 early adopter high schools that will design and pilot Relationship Centered Schools. Fresno: Won $68,000 to launch a Relationship Centered Schools design team process with leaders from Fresno Unified School District, students, and 3 early adopter high schools. Long Beach: Won a Task Force for Relationship Centered Schools that will strengthen restorative justice at Cabrillo High School. Investing in teachers: Helped Learning Policy Institute win $33 million from the State to support teacher preparation, scholarships, and professional development. Protecting our communities: Passed resolutions in 3 school districts and AB 699 (O’Donnell) at the state-level to protect undocumented youth and families at school. 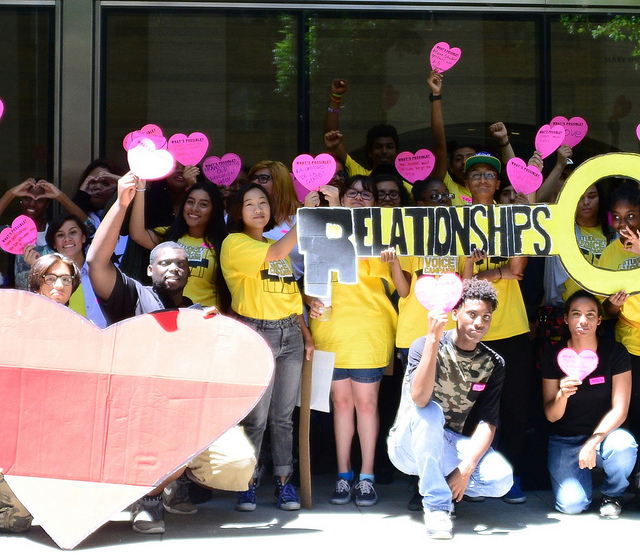 School climate is the heart: worked with the CA Department of Education to develop a new framework for School Climate & Conditions; students and allies mobilized to Sacramento to show their support. 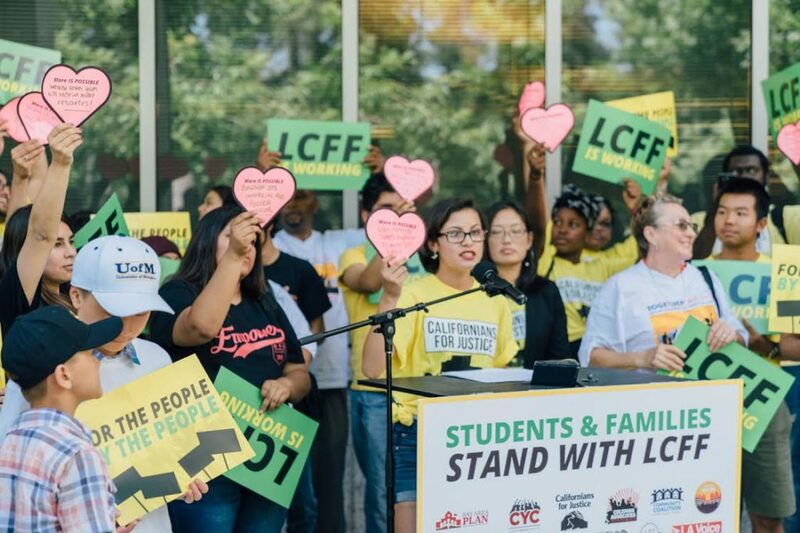 The Local Control Funding Formula (LCFF)– Students, parents, community advocates, and policymakers representing more than 30 cities held a press conference in Sacramento to send a clear message to California legislators and to the future governor: LCFF is working. Student and parent leaders then met with the Governor’s office to discuss the future of California’s equitable funding formula for low-income students of color. 18 student and parent organizations across the state came together to form the LCFF Defend and Mend Coalition. In 2018, we’ll be advocating locally and statewide to resource LCFF and ensure that student and parent voices are at the center of the equity formula to ensure that general education policies are supporting students across California schools. In the Fall, youth leaders and CFJ alumni in Long Beach and San Jose piloted voter registration drives in their high schools and college campuses. Voter registration is a key tactic in our civic engagement work to increase voting power for young people in California. We look forward to a powerful year ahead as we continue to advance our campaigns. In the Spring, we’ll engage with legislators at our Relationship Centered Schools Convening and youth will continue to make progress in our four regions as they implement Relationship Centered Schools. In Sacramento, we hope to introduce a state budget bill to bring more funding to LCFF, to strengthen school climate and student and parent engagement. Lastly, we’ll continue to build youth power by holding school board candidate forums, getting 9,000 young adults of color out to vote for the 2018 elections and registering 1200 young people to vote.